Our mattress encasement delivers 360° coverage—designed for maximum protection of your health, and the life of your mattress. "Owning their own factory gives Brooklyn Bedding extraordinary control over their materials, cost, and assembly specifications." "[Brooklyn Bedding offers] high-quality product sold at extremely competitive prices. Their direct-to-consumer business is reflected in the brand's ability to pass savings along to their customers." "There’s no doubt with Brooklyn Bedding that the designers and manufacturers are mattress experts and knew very well how to make a quality product." Does the mattress encasement provide full protection? 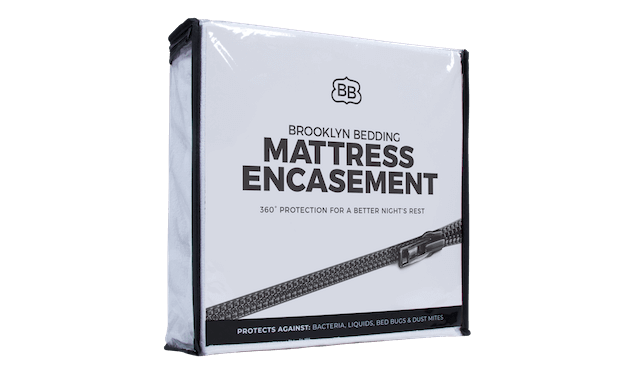 Yes, the Brooklyn Bedding Mattress Encasement provides 360º protection for your mattress. Constructed with a unique, zip-tight enclosure, the encasement is designed to enclose all of your mattress while maintaining the breathability of your current mattress. Is the mattress encasement hypoallergenic? Yes, the Brooklyn Bedding Mattress Encasement is constructed of a 100% polyester material that is both hypoallergenic and waterproof. Will the mattress encasement reduce the breathability of the mattress? The 100% polyester construction of the Brooklyn Bedding Mattress Encasement provides a crisp, soft hand that helps maintain both breathability and any existing cooling technology in your mattress. If your mattress is designed with a smooth top, and you cover it with an encasement, you may notice the surface of your bed is not as cool to the touch—however, the actually cooling technology or breathability properties beneath the top should still permeate the encasement to provide a cool night’s sleep. DOES YOUR TRIAL PERIOD INCLUDE SLEEP ACCESSORIES? Yes, our 120-night trial period extends to most sleep accessories*. Should you need to return a product, we ask that you package the merchandise and contact us at support@brooklynbedding.com with package dimensions so that we can email you a prepaid shipping label. We then ask that the merchandise be shipped back to our facility at no charge to you. *Our 120-night trial does not extend to our Electric Adjustable Base, which cannot be returned after purchase. However, we do offer optional 1-year, 3-year and 20-year warranties for an additional cost. Contact our customer service team at support@brooklynbedding.com for more information.